A deck makes a great home improvement addition to almost any backyard. However, building a deck can become a time-consuming chore if you must dig holes and pour concrete to set your deck posts. 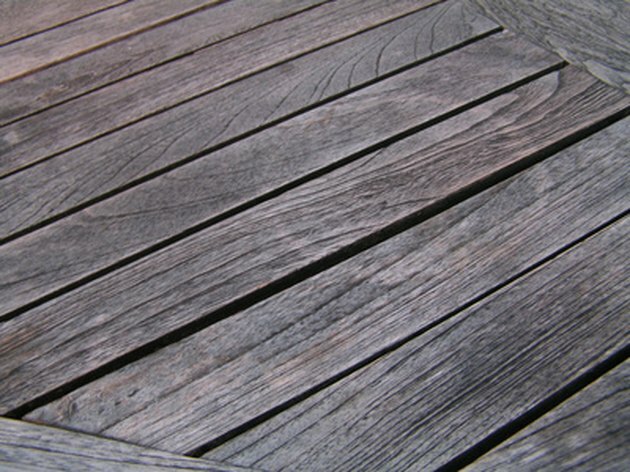 Fortunately, there's a simple, cost-effective way to build a deck without digging holes. Construct a floating deck with precast concrete deck piers that rest directly atop the soil. With a bit of assistance and the right tools, you can build a basic deck in a weekend. Precast piers make it unnecessary to dig holes for your deck. Set your precast deck piers in a grid, at roughly three- to four-foot intervals. Lay your piers so that one foot of the joists will extend past the piers on either end. This will allow the band joist to conceal the ends of the other joists, and hide the piers from view. Measure your grid diagonally from corner to corner, using a measuring tape. If the two measurements are equal, your grid is square, meaning the width and length are consistent. If one side requires adjustment, move the piers and remeasure until the diagonal measurements are equal. Extend the line level to determine if the piers are level as a helper holds the other end. Check the level in both directions. If necessary, use your shovel or spade to remove soil from beneath any pier that is too high. Conversely, use your leveling sand to build up the soil level beneath any pier that sits to low. Continue checking until all the piers are level in both directions. Insert the pressure-treated floor joist planks into the precast slots in the piers. Use your level to ensure each joist is level. Lay a plank across the top of all the joists to check that each is level with all the others. Adjust the pier heights if necessary. Attach the band joists across the ends of the other joists with three-inch vinyl coated screws, using your drill driver. Align your deck planks so they are perpendicular to the joists. Attach each with vinyl-coated green screws. With your helper's assistance, use two screws as spacers between each plank you attach. This ensures consistent spacing of the planks and provides a place for rainwater to drain off. Remove and reuse the screws as you align and attach each plank. Snap a chalk line across the deck plank ends with your helper's assistance. Use your circular saw to trim the plank ends even.